There are various uses of electricity in our daily life. We use electricity to light our homes, heat our rooms, to electroplate metals and many more. While using electricity we are basically converting electrical energy to various forms according to our need. These conversions of energy can also be regarded as effect of electricity. There are various effects of current and we will talk about two of those in here. The process of electricity conduction in liquid is called electrolysis. The process of electrolysis is possible due to presence of ions in the liquid. If a liquid cannot disassociate into ions then it cannot conduct electricity. For the process of electrolysis, we have to have a source of electricity (batteries) two rods that can carry electricity (anode (rod connected to the positive terminal of the battery) and cathode (rod connected to the negative terminal of the battery)) and solution that can carry electricity. The solvent used to make water conductive must be H2 SO4 if you want to get hydrogen and oxygen as products. If you use hydrochloric acid or table salt the products will differ. The cathode and anode must be graphite rods (or any other non-reactive material) or else the output of electrolysis will differ. The process of laminating one metal to the other using electricity is called electroplating.It is similar to the electrolysis process as it requires a liquid medium that conducts electricity and a source of electricity and two rods that can act as cathode and anode. But in the process of electrolysis we use metal from anode to plate into the metal in cathode. Here products at anode and cathode do not have any importance rather metal from anode gets thinner as it gets plated on the metal in cathode. We are going to discuss electroplating of copper on iron nail. Electroplating stops when all the metal from anode is plated to anode. The metal being plated should always be at cathode and the metal gets plated is at the anode. The salt used in the solvent must be the salt of the anode metal. Ostered discovered that electric current flowing through a conductor produced a magnetic effect around it. Micheal Faraday discovered that it was possible to obtain electric current in a circuit from a magnetic field. Magnetic lines of force start from N- pole To S-pole. Internally these magnetic lines of force move from S-pole to N-pole. Magnetic lines of force are always closed. Magnetic lines through a surface of magnetic lines of force passing the surface held perpendicular to these lines of force. When current is passed through a liquid, it undergoes some chemical changes. This effect is called chemical effect of current. Electrolysis is the process of decomposition of an electrolytic solution into its constituent passing an electric current through it. Electroplating is a process of depositing a thin layer of metal over a conducting surface by the process of electrolysis. Magnetic lines of force start from N- pole to S-pole. The process of breaking down of electrolyte with the help of electricity is called electrolysis. When electricity is passed through the solution of electrolyte, the chemical reaction takes place. This process of decomposing electrolyte into ions is called electrolysis. What is meant by electroplating? What are the three basic conditions necessary for electroplating? The process of coating one type of metal on other with the help of electricity is called electroplating. Anode, made from metal, should be used as coating. The material which is to be electroplated should be kept as cathode. Electrolyte should be made from the salt of metal that is used as coating. Write down any two uses of electrolysis. It is used to purify different impure materials. Simple basic substances can be obtained easily through electrolysis of chemical compounds e.g. oxygen and hydrogen of water. What happens when pure copper plate is kept instead of iron nail in the given figure? The copper ions (cu++) will be collected on pure copper plate and result in the increase in size when pure copper is kept instead of iron nail and we can obtain pure copper as the result of this process. 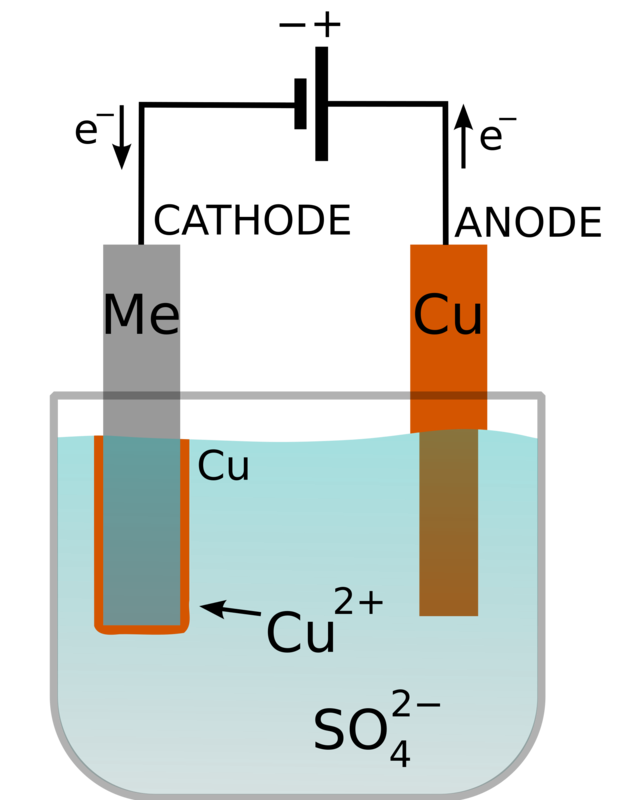 Why does the copper anode can't be used in water electrolysis? the copper anode can't be used in water electrolysis process because nascent oxygen formed during the process reacts with copper to form copper oxide due to which the amount of oxygen will be reduced. That is why, copper anode can't be used in water electrolysis. The electrode, connected to the positive terminal of a battery, is called ______. The electrode, connected to the negative terminal of a battery, is called ______. Electrolysis of water produces ______. When electroplating copper to iron ____ should be placed at cathode. Which of these solvent must be used during copper plating? why in the electrolysis of water , the volume of gas collected at cathode is double than the volume of gas collected at anode???? Difference between conductivity of metal and conductivity of electrolyte? Diff between conductivity of metal and conductivity of an electrolyte? Is anode positive or negative ??? Any Questions on 'Chemical Effect of Current '?